We’re well underway installing the finishing surfaces on the house’s exterior. Siding, soffit, channels, corners, and flashing… these works require an array of new materials, and with them come a cadre of specialized equipment and skills to master. For example, the aluminum brake. Every edge of the finished exterior – corners between two walls, wall to roof, roof to soffit – needs a solid surface wrapped around it to prevent water infiltration, and that’s where aluminum flashing comes in. I make flashing using the brake, which is kind of like an 8-foot-long vise into which you can slide a sheet of aluminum to either cut it or bend along a straight line. With some careful measuring and a utility knife for scoring, the brake makes it easy to create the thin L-shaped strips of aluminum we need. Aluminum brake: folding to cut. Colin chose vinyl for our siding, because the material is manufactured to look just like painted wood yet requires virtually no maintenance. Working with siding is a whole new animal. On one hand it’s forgiving: you can cut a piece shorter than the space you want to fill, and channels on either side hide the discrepancy. (In fact we NEED to cut each piece slightly short to give the siding room to expand in hot weather, because vinyl has a much higher thermal coefficient than wood.) On the other hand it’s very fussy: you have to make sure that each piece is absolutely level and that the horizontal lines match around the entire perimeter of the house. Remember, siding is the finish surface, and if one piece is even a little crooked then people WILL notice! Walk-out basement and grill porch siding in progress. Colin checks alignment. Since each length of vinyl siding snaps into the piece below it, we started with the walk-out basement – the lowest exterior wall. Next we worked our way around to the grill porch, over the breezeway, and up the north-facing wall. We cut pieces with either a circular saw (special plastic-cutting blade) or handheld nippers, trimming around windows and doors. Today we turned the northwest corner and sided the main façade to the road. We completed our first-floor façade by sunset, and the difference is like night and day. The house looks finished now, at least below the porch roof. It’s pretty amazing. 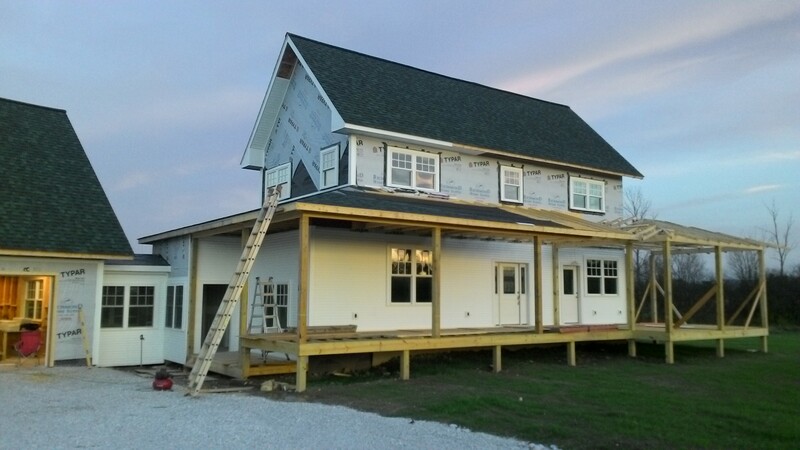 Speaking of the porch roof, Terry is aching to finish it, but wet weather keeps getting in the way. 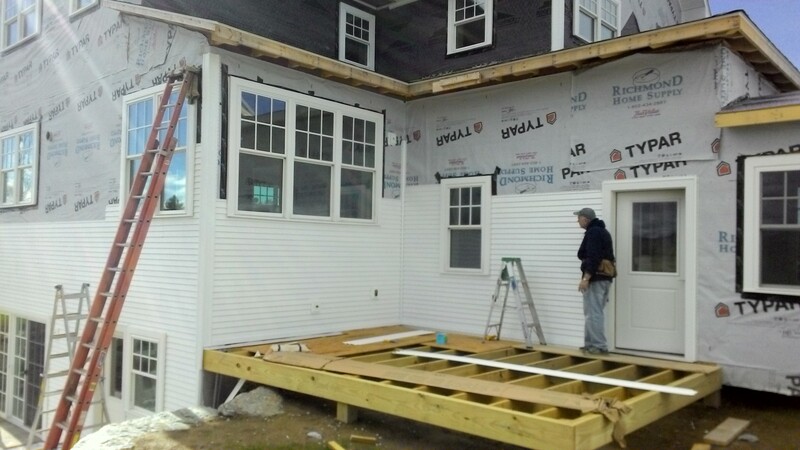 As soon as the ground dries enough to set up a ladder on it, we’ll take a break from siding to tackle that project. White on white: this house is a showstopper.